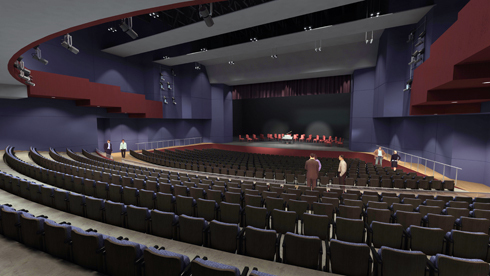 In a unanimous vote Sept. 20, the OCCC Board of Regents approved design plans for the new Performing Arts Theater. The 1,000-seat theater will be built inside the U-shaped area formed by the classroom portion of the Visual and Performing Arts Center, extending out to the west with a foyer and entrance. An artist rendering of OCCC’s new theater. 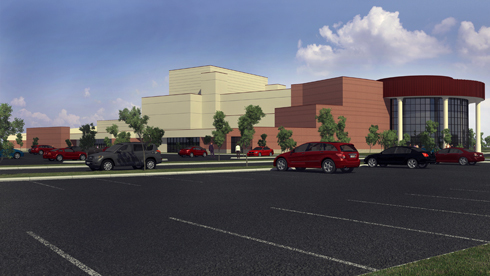 In a unanimous vote Sept. 20, the OCCC Board of Regents approved design plans for the new Performing Arts Theater. 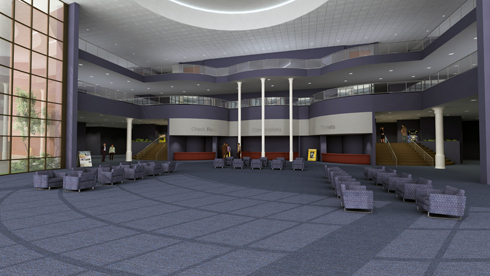 The 1,000-seat theater will be built inside the U-shaped area formed by the classroom portion of the Visual and Performing Arts Center, extending out to the west with a foyer and entrance. Total cost for the project will be $16 million, said Regent James White. Private donations and other sources will supply about half the cost, while the other half is being funded by student revenue bonds. Groundbreaking is 2 p.m. Oct. 7. The 1,000-seat theater. OCCC regent Dave Lopez said the theater will be the only facility of its kind between downtown Oklahoma City and Norman. Anticipated completion date is December 2012. Total cost for the project will be $16 million, said Regent James White. Private donations and other sources will supply about half the cost, while the other half is being funded by student revenue bonds and capital improvement funds set aside by the college. Last week the committee as a whole and [architect] Walt Joyce of Triad Design group presented the design plans for the performing arts theater, White said. The classrooms, which constituted Phase I of the project, were finished in 2008, White said. Phase II, the theater portion, was put on hold due to lack of funding. White said the new theater has an anticipated completion date of December 2012. “This is a very momentous time for our college,” President Paul Sechrist said at the Regents meeting. “The dream of a performing arts theater has been in the long-range planning ever since I have been part of this college,” Sechrist said. Members of The Leadership Council that voted yes to add a fee to build the theater will no longer be students when the theater is completed. Diane Draper, diversified studies major, said the bond that will pay for half of the theater is a way the students can pay it forward. Phillip McDonald, business major, agrees. “I actually think it is a good thing, I was in music appreciation my first semester and we had to go to music presentations and I thoroughly enjoyed it. If I had more time I would have gone to more things that were there. “It brings people from the surrounding communities, not just students, to really teach them about the arts,” McDonald said. The ceremonial groundbreaking is set for 2 p.m. Thursday, Oct. 7, Sechrist said. The design plans and renderings will be on display outside of the Al Snipes boardroom near the admissions office.